Like Neruda and Paz, Perse and Milosz, Christopher Merrill is both a writer and a cultural envoy, crisscrossing the globe as chronicler and courier. 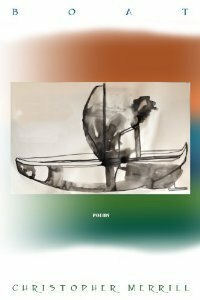 Boat records a series of passages over a decade, employing varied formal strategies: meditations and fantasias, prose poems and versets, lyric sequences and narratives, translations and ghazals. Composed in war zones and embassies, refugee camps and monasteries, Boat is a logbook tracking questions of memory, the body and body politic, faith, mortality, and the ways of knowledge moves through generations. Reflecting ten years of life on the wing and forty years of writing, including extensive translation from other languages, Boat bears witness to what Merrill has heard and seen in places most Americans will never visit. Buy the book on Tupelo, Amazon, Powell's Books, and Barnes and Noble.